Construction work went on so long that tastes changed as the cathedral rose. Arciniega's Renaissance base supports a Baroque tier and above it a neoclassical one. The Baroque is on display here, with a central panel framed like a picture and depicting the Assumption--remember that this is the Cathedral of the Assumption--flanked by Saints Andrew and Matthew intercalated between columns. 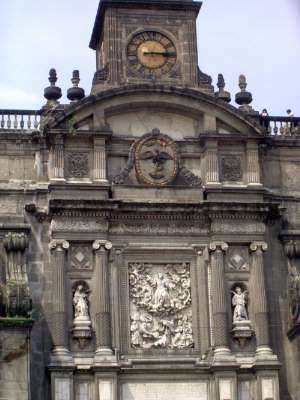 Above them, the Neoclassical clock and balustrade were added by the Spanish sculptor Manuel Tolsá shortly before his death in 1816.